Not specifically about marketing but interesting all the same! I picked up this book as I’m going through a ‘should I get another degree or just read more’ phase. (If you’re curious the current decision is just read more). 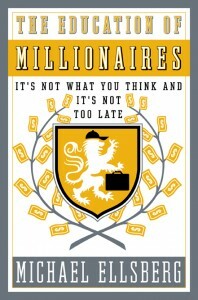 Education of Millionaires is filled with a range of tips, tricks and advice from interviews with some v. clever people. It’s a little anti-degrees/college but it’s very pro education/learning in general, which I like. b) never, ever, ever think that it will be enough. Never stop learning once you graduate – unless your goal is to stay stuck in the same job or slowly drift backwards. It has to do with your drive, your initiative, your persistence, your ability to make a contribution to other people’s lives, your ability to come up with good ideas and pitch them to others effectively, your charisma, your ability to navigate gracefully through social and business networks (what some researchers call “practical intelligence”), and a total, unwavering belief in your own eventual triumph, throughout all the ups and downs, no matter what the naysayers tell you.